A happy week for us. We are enjoying the cooler temperatures and I must admit I have my long johns on today. The pace has slowed some from the summer frenzy of planting and watering and weeding and harvesting. The Autumn crops are bountiful and beautiful and now we can enjoy the fruits of our long summer labor. A calmness has settled here and we are enjoying every minute. Small putsy jobs we have put off all summer are finally being completed, shelves are being tidied up and stuff is being put away in the greenhouse. We find our thoughts already wandering to next season and things we want to do-different vegetables we would like to grow, where the crop rotations will fall and expanding the strawberry beds. Maeve and I have been baking maniacs now that the heat has broke and we made a hearty soup with the last pumpkin from last year’s harvest. This truly is my favorite time of year. 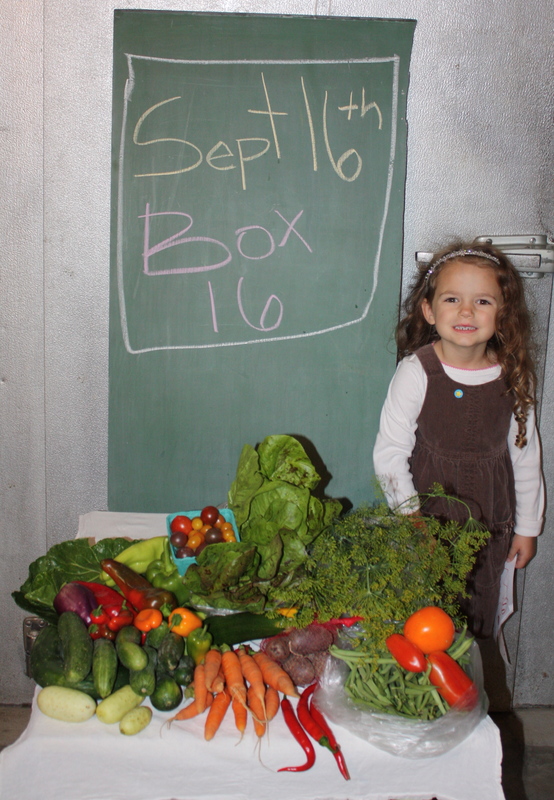 A moment of thanks to every member of our Summer CSA. We are grateful for this life we have here at home with our daughter Maeve. Thank you for supporting our dream. It’s hard work and sometimes difficult but Scott and I realized a long time ago that we are happiest with dirty knees and rough hands. Everyone of you have made this possible. We finally had a good rain after 3+ hot windy weeks of extreme drought. It is refreshing to all the autumn plants in the garden and takes the pressure off of Scott with the irrigation rotation. 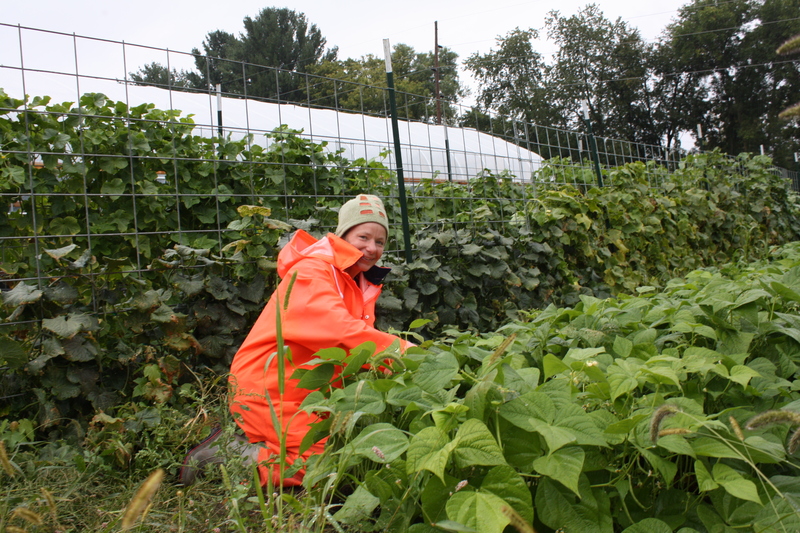 We picked beans in the rain yesterday which was a bit chilly, cold and loud but we were not complaining. 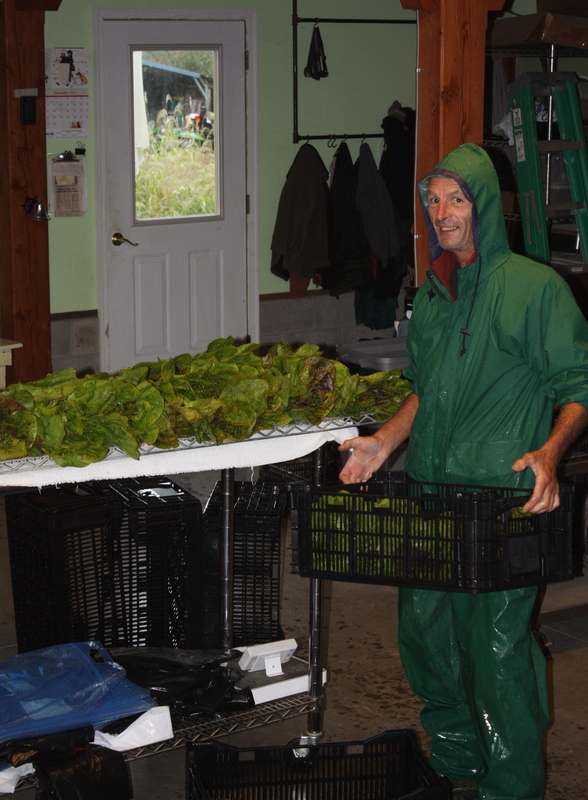 We also harvested the lettuce in the rain in the new hoop house without getting all muddy and the lettuce stayed nice and clean too. A treat! We still had to haul it up and wash in the rain but again no complaints. Average box weight is 12.02. 493 pounds of delicious vegetables left today. Another fabulous box this week! This will be a week of transition too. I think many of our summer crops are coming to an end. Lettuce-A sweet and pretty German head lettuce. Zucchini-We may be nearing the end of this summer staple in the boxes. Our second bed is starting to slow down with the cooler temperatures. Cucumbers-I do believe this is the end of the looooooooooooong cucumber marathon. FINALLY! Enjoy the last of the long Asian and European beauties and the final snack pack. Dill-We just felt we had to add a bunch this week with the cucumber farewell. Green Beans-A snappy bag of 3 varieties. Carrots-1 pound+ bags for everyone. Sweet and flavorful. Peppers-A pepper mother load this week! A colorful variety. Sweet long yellow bananas, sweet bull horns called Carmen, colorful bells, a bag of those cute sweet little lunch box guys and a bag of long red hot tuberons. Purple Potatoes-Taste great fried or make the best purple mashed potatoes! Surprise your family with dinner this week. Collard Greens-An assorted bunch. Delicious sautéed or as a bread replacement with sandwiches. Cherry Tomatoes-A colorful 1/2 pint of the pretty heirlooms. Lots of watermelon and cantaloupe in the extra/trade boxes too if anyone would like one. BEST GUESS FOR NEXT WEEK-chinese cabbage, broccoli, brussels sprouts, carrots, storage onions, beans, + more.